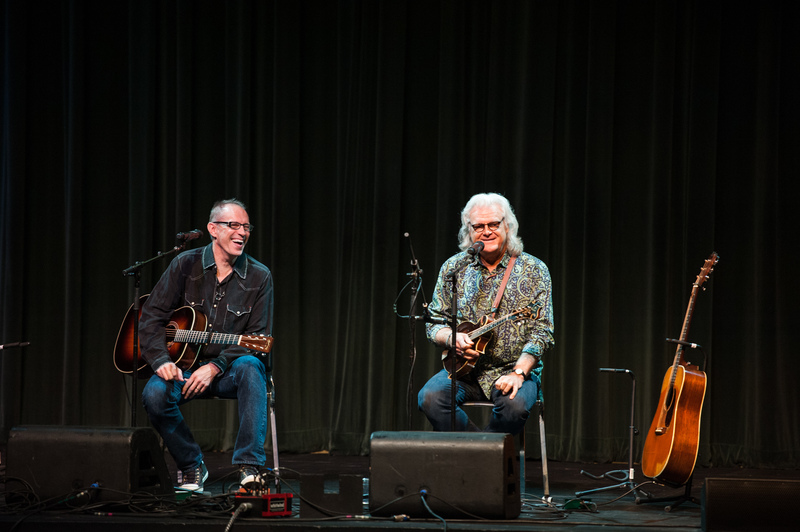 At a Chapel event co-sponsored by the Curb College of Entertainment and Music Business, Ricky Skaggs, who has garnered 14 GRAMMY® Awards, 12 No. 1 hits, eight CMAs, eight ACMs and Belmont’s Applause Award, and Belmont alumnus and world-renowned guitarist Gordon Kennedy, Songwriting Program teacher and multiple GRAMMY® Award-winner, performed Wednesday morning, September 2. The two sang three songs and talked about their journey through the music industry and their Christian faith. Next, the pair played “Can’t Shake Jesus,” another “Mosaic” song. Skaggs said that another way to hear God is through prayer. “We were meant to pray. We were born to pray. We were saved to pray. We pray not to change His mind, but to change our heart,” he said. Kennedy added that he understands the frustration college students face with not having everything planned out in their life. “God doesn’t want us to know each step. The ‘Give us this day our daily bread’ prayer never mentions tuition or starting a 401k. Ask God simply, ‘What is the next step?’ And ask for His help with that,” he said. Concluding with the album’s last song, “Return to Sender,” the duo emphasized the importance of a relationship with Christ, rather than simply following a religion. “A relationship is His desire to get to us. He wants us to wake up, to talk to Him, love Him, praise Him, share with Him and tell others about Him. Loving Him and loving others should be our default setting,” said Skaggs.